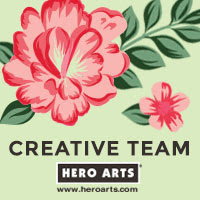 Hello there, over on the Hero Arts blog we are sharing ideas on how to use the My Monthly Hero February Kit. We will be sharing ideas all weekend and then on Monday, the kit will be revealed and we will be having a blog hop to celebrate so please do stop by my blog then. Today I am sharing a cute card using the main kit stamp set and dies, along with an awesome add-on stamp set for the sentiment. There are lots of chances to win a kit so please head over to the blog to see more! I have had a lot of questions from UK crafters asking about the kits following my post about the subscription service. Yes, you can subscribe to the kit being international but you do have to pay shipping. I believe that if you order just the kit itself shipping will be about $19.99 which is approx. £15.80. The last time I ordered a kit it took about two weeks to get to the UK. It did get stuck in customs so that did delay things somewhat. I got charged £8 VAT on arrival to the UK (I did buy more than just the kit itself though), as well as having to pay an £8 Royal Mail fee. The kit itself costs $34.99 (approx. £27.66), along with the postage and fees, the kits for UK customers come to approx. £56 or so depending on if you just buy the kit itself or any add-ons (this will affect how much VAT you have to pay). If you were to buy all of the items in the kit separately, the cost of it would be $75 which is approx. $59.30 (that is without the added costs of postage and customs fees) so you are still saving money by going with he kit. Is it worth it? Only you can decide that. If you currently buy the kit each month, personally I would say go ahead and subscribe so that you don't miss out. If you just like the look of one or two at the moment then maybe hold off subscribing for the time being and order the kits separately. Hero Arts are working on ways to reduce costs to international customers. I apologise that I can only talk about postage to the UK, I have no experience of fees etc. in other countries but if you are international, hopefully this may still help you. Thanks so much for visiting me today. I hope you have a great weekend! That Royal Mail handling fee isn't the thing that gets me. I'm assuming it's because they have to make a separate trip to a customs depot to get it. But they charge per packet, which is a killer. I do think it's a good deal though if you like the look of it each month! This looks very sweet and I look forward to the full reveal. I think that you all get soaked getting packages from other countries! I would think it would be a good deal if I found that I really loved the kits that I was getting, especially since the kits are limited edition. 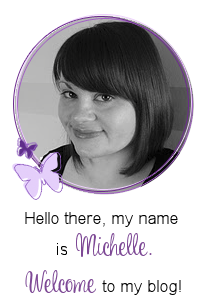 I always enjoy your work Michelle, and I'm looking forward to your reveal on Monday!